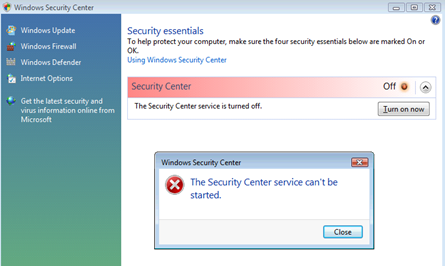 Had a Vista Home Premium PC in the workshop the other day infected with viruses & malware, after being fully cleaned started getting a warning in the tray saying that the Windows Security Center could not be started..
After closer inspection of the services (Services.msc) it appeared to be totally missing, which is why it would not start, So i had to get the service replaced in order to get it to start, after lots of googling I found the registry keys that needed to replaced.. Copy the text below in red.. Right click the desktop & create a new file & rename to Security Center.reg, right click & edit and paste in the text from above and save, Then right click & merge and you should get a confirmation the the keys & values have been successfully added to the registry. Press the Windows key + R & type in services.msc, The service was now listed but would not start, a bit more googling I found that its dependancies were the Remote procedure call (RPC) & the Windows Management Instrumentation services, I checked & the Remote procedure call (RPC) was running, I then checked the Windows Management Instrumentation service and it was missing as well which explained the service failing to start. Saved, then merged with the registry, I then checked services.msc & found it was now there, I right clicked the Windows Management Instrumentation service and clicked Start which it did..
P.S. The above information should also be good for Windows 7 as well BUT please check the info above yourself before you play with the registry as it easy to trash & have a non booting windows, And ALWAYS create a system restore point before making any changes..